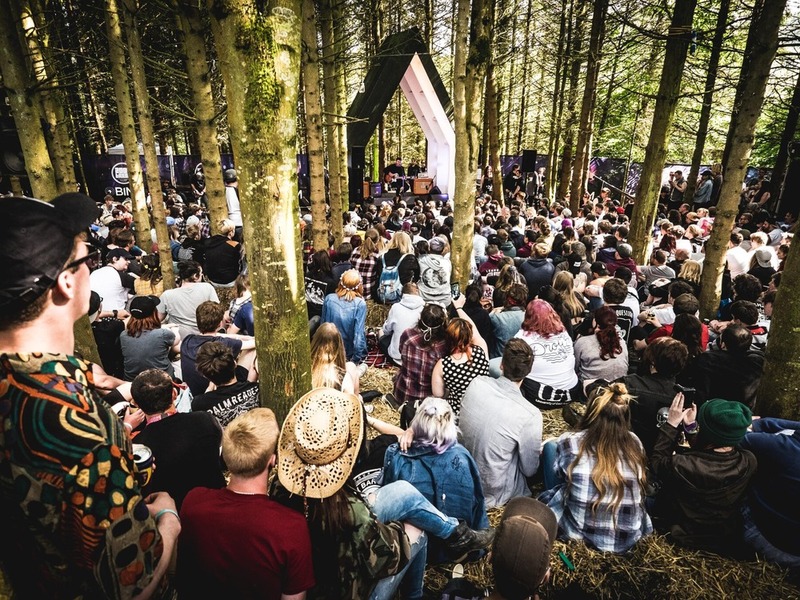 2000trees Festival returns to Cheltenham for their 12th year from 12th-14th July. The 3-day outdoor rock festival will host At The Drive In - over for a UK festival exclusive, Enter Shikari, Hell Is For Heroes, Creeper, Basement, plus many more. 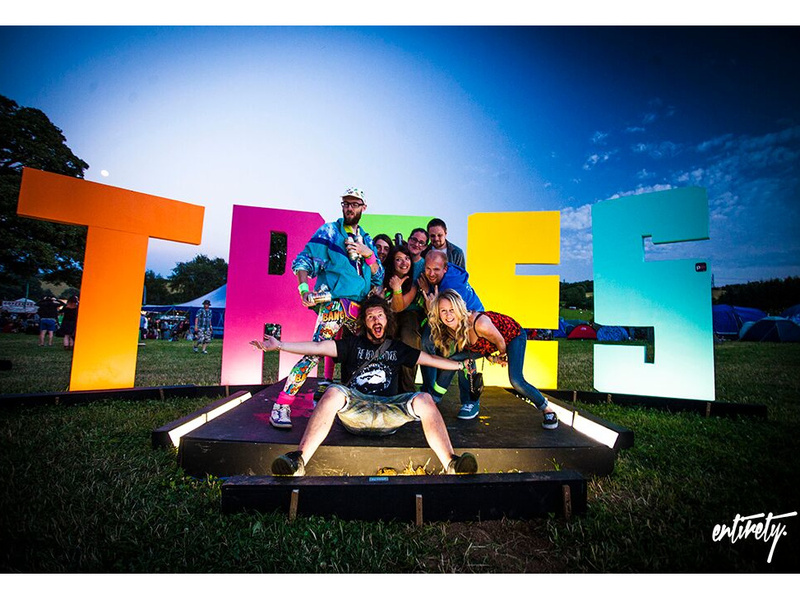 We caught up with 2000trees founder and artist booker, James Scarlett, who fills us in on how it all began, the importance of community spirit between bands and audience, and the trick to bagging a killer line up year upon year. There's rumours that the festival was started over a heated game of strip poker with five of your good pals. As much as we want this to be true, what really went down? Haha! Yeah, that wasn't quite what happened! We were all keen festival goers (Donnington Monsters of Rock, Reading Festival, Truck Fest, etc), but we didn't feel that our needs were really being met. What we wanted was something that took the rock line ups of Reading and Donnington, but had a more "boutique" feeling, with a bigger focus on having great food & drink, clean toilets and a beautiful location. With a smaller capacity of around 10,000, I really think you can give people a much more enjoyable and relaxing festival experience. Looking back over the last 12 years, I think we've pretty much achieved what we set out to do, and that makes me very proud. When do you start planning for the festival? Is it a case of closing the festival and the very next day starting preparations for next year? Yep, pretty much! The day after the festival finishes we always sit down over a BBQ and a few beers and chat about what we want to do the following year, and how we can continue to improve. This conversation can range from bands we'd like to invite back (or next years' headliners), all the way through to where we put the toilets. We also spend a lot of time flicking through social media and seeing the good, the bad and the ugly. Over the years we've had 99% positive feedback, but I feel it's very important to listen to the 1% and keep on improving. You've always pleased the fans with popular acts returning year upon year, which is a rarity for festivals these days. How important is this to the spirit of the festival? I think it's really important. I like to keep the line up fresh every year, but I think having returning favourites is great and really helps to foster a community spirit between the bands and the audience. Acts like The Xcerts, Black Peaks and Arcane Roots love the festival as much as we love them, and my dream is that one day they can come back and headline the Main Stage. Neck Deep at 2000trees Festival 2016. Photo: Donna Coombes. What are some of the recurring issues that you face each year? After 12 years, I think we're pretty good at what we do, so there aren't that many big issues. However, exclusivities on bands do make life a bit tricky at times – I think a lot of people don't realise that if a band is playing at another UK rock festival, then it's often not possible to also have them at 2000trees. However, we're in a privileged position where bands like Enter Shikari and At The Drive In genuinely want to be play an event that is 100% independent and free from corporate interference. I think the only other thing that can cause difficulties is rain, and I'm ecstatic to say that we haven't seen a drop in the last 6 years. And the forecast for this year is scorchio! You're a festival known for championing new artists and bringing acts over from all parts of the globe. What's your recruitment process – where do you find these wonderful bands? I have lots of people across the music industry that I look to for recommendations (booking agents, journalists, record labels, managers, etc), and I feel that in some way they do the filtering for me. So instead of me listening to 10,000 bands a year, I listen to, for example, the top 1,000, and I think that means we get the best possible line up of new and underground rock acts in the UK. 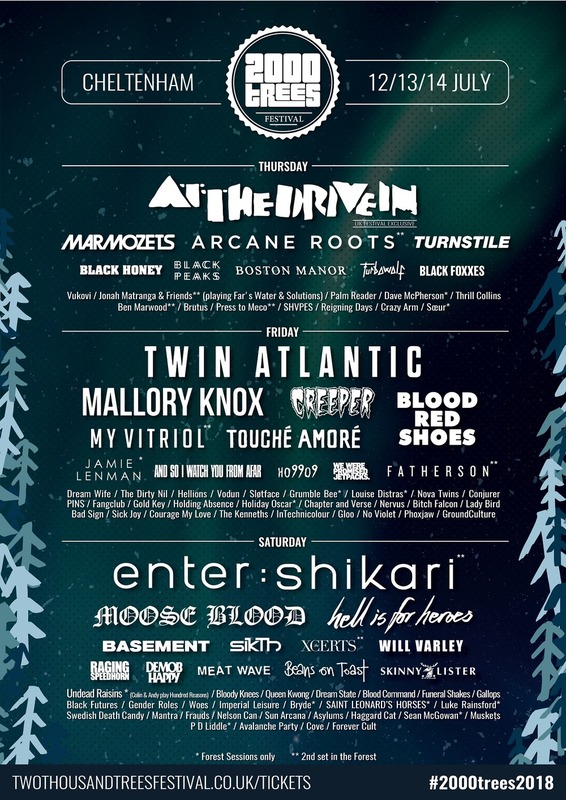 I'm very passionate about these new acts and I'd really recommend that people check out the 2000trees Spotify playlist before they come to the festival. At the end of the day, there is no better feeling than discovering your new favourite band. 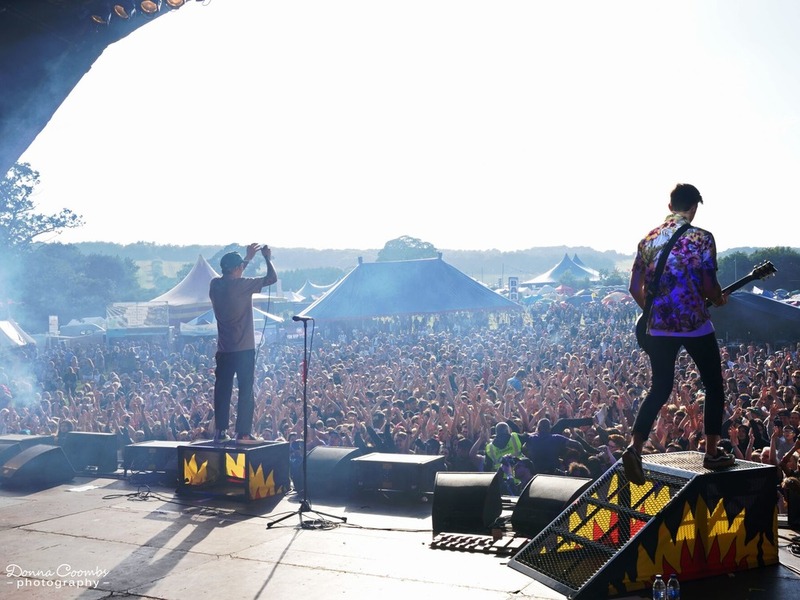 2000trees 2014. Photo: Ross Silcocks. You're also known for booking bands as a UK festival exclusive. Is this something that you strive for each year, or is it down to the magic of your negotiating skills? It's complicated! Sometimes a band will come to the UK for just one show (At The Drive In) or they may want to do some other festivals or headline shows in the same summer. Ultimately it's all part of a negotiation that can take months just to get one booking confirmed. It's a long, stressful process but I'm very happy with our line up this year – it's definitely our strongest one yet. What words of wisdom would you give to the promising promoters out there, looking to get into the festival scene? Start small and don't risk too much money at the beginning. The beauty of promoting is that you can learn on the job and build yourself up one step at a time. The Forest Stage at 2000trees Festival. Photo: Gareth Bull. It has to be asked – what's the most insane rider request you've had for a band so far? There's not been anything too crazy at 2000trees to be honest. One band wanted a robot (they didn't get it). And another wanted a 3 course meal for 30 of their friends and family, with table cloths and place settings. We did our best with that one! You just wait to see what we've got up our sleeves for next year – it's going to be big and amazing! Grab your tickets for ​2000trees Festival 2018 and learn more about the bands here. You can also check out their official website, Facebook page, plus their Twitter and Instagram accounts. 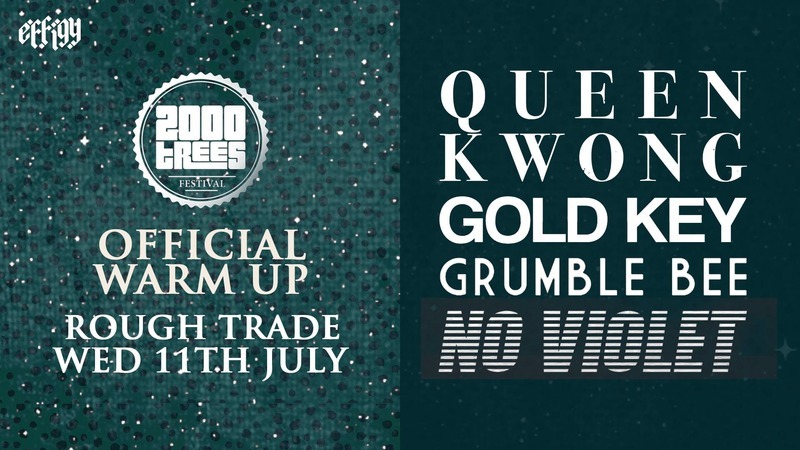 You can also check out the 2000trees Official Launch Party at Bristol's Rough Trade on Wednesday 11th July, featuring Queen Kwong, Gold Key, Grumble Bee and No Violet. Tickets are on sale now and are available here.